Thanks so much to all of you who wished me well during the “Benign Whirlies”! I’m feeling much better and a lot more stable on my feet! One good thing about not going to work is that I’ve been able to work on some UFO’s for the holidays! I re-sandwiched my fall table topper with Warm and Natural and have begun quilting it with just an overall stipple and a variegated thread. This project has been languishing in a drawer waiting for finishing touches. I’ll use it for a table topper. It’s made mostly from homespuns and I used a wool felt for the appliqué. I also used left over fabric for the binding. By the way, I’m using a great new photo editing service I found called Picnik. You can do lots of photo editing for FREE - and we quilters all love free! It's very easy to use, too, unlike Photoshop which I find terribly confusing! Tomorrow I’ll show you another Christmas runner that I finished as well. I’ve been meaning to show you this cute little trailer. It’s been parked on the street near where I walk for a couple of weeks now. I could just see my husband and I pulling it around the country after we retire! Yes, I can actually drive,turn and back a trailer! I think it’s a right brain, left brain thing….I got it right the very first time I ever tried! Anyway, I love the sleek, modern lines of this little guy - I can just imagine all the goodies and gadgets it has when you set it up! For now, however, I'll just have to dream about it! My husband's family had a trailer like that when he (age 63 now) was little. 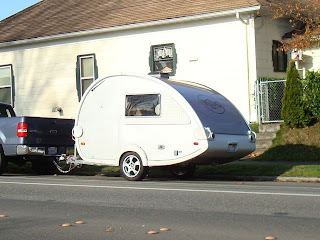 He calls it their "tear-drop" trailer. It had a "kitchen" which folded out so his mom cooked standing outside. He has fond memories of it. 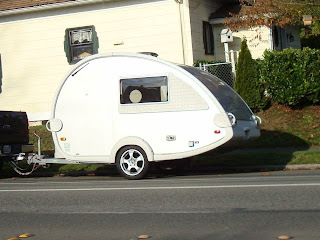 Whoa, that is one tiny camper. How does a person stand in it? 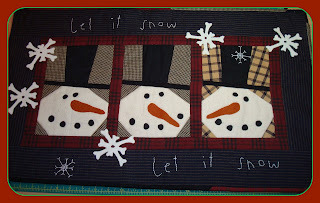 Love your snowman tablerunner. Glad you're feeling better and OMG your work is AMAZING! I love the colors you use Candace! Very warm an cozy!